★★★★ The Times FOR three successive springs now, on the top floor of a former W.D & H.O. Wills tobacco factory in the Bedminster area of Bristol, Andrew Hilton and his company have been creating wonders of theatrical intimacy. The acting area is larger than in most theatres in the round, three or four times the size of Sam Walters’ at the Orange Tree or Ayckbourn’s in Scarborough, yet an exceptionally close relationship between audience and actors has emerged at both the productions I have seen here. In the crowd scenes of last year’s Coriolanus the jostling plebs were clearly individuals brought together by personal protests and not rhubarb-sayers supplied by Rentamob. Hilton’s eye for nuance and the fleeting indicators of feeling make his two annual productions (each running for five weeks) highlights of the country’s theatre scene. This season’s Twelfth Night uses a scrupulously plain stage, bare except for some plump-legged Elizabethan chairs, sometimes a chest or table, with the lighting’s brief seashore-ripple effect providing the only indication of a wider background. Against this simplicity the emotional journeys of the characters lie open to our eyes, beautifully revealed in Esther Ruth Elliott’s Viola. She has a quiet courtesy of bearing, tinged with a hint of alarm, apt not only for her arrival on Illyria’s coast in a sea-stained skirt but when negotiating the maze of misplaced loves aroused by her beauty. 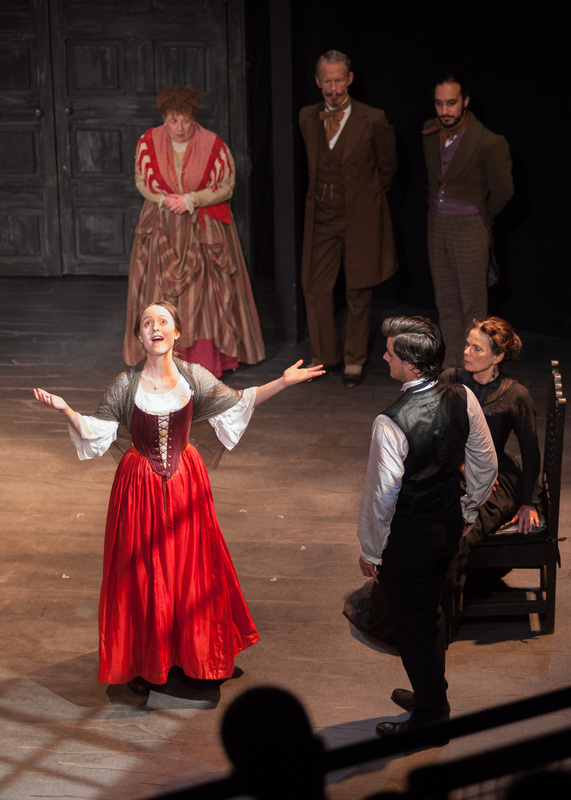 Disguised in doublet and hose, she stands with an appealingly adolescent awkwardness in the presence of Tom Espiner’s Orsino or Lucy Black’s Olivia, contradicting the apparent ease of her little smiles with quick glances to right or left, as though looking urgently for an escape. When Orsino sets his hand good-humoredly on her knee the sense that her feelings will betray her is poignantly real. Her voice, too, has a musical delicacy delightful to hear, restrained in the “willow cabin” speech, tragically distressed when imagining a life in which a love can not be admitted. The scenes between her and Black have their undercurrents of comedy as well as dismay. Black gives a vigorous sense of inherited authority to Olivia that makes good contrast with her outburst of embarrassed self-criticism. You sense her arms itching to smack herself for being such a love-smitten fool. 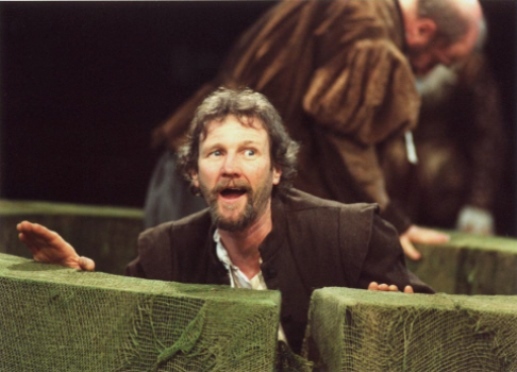 In the broader comic scene where Malvolio is ruthlessly gulled, the box hedge concealing the eavesdropping knights is like a green stewpot inside which they heave themselves up in protest and pull one another down. This entire scene is riotously funny, with a plump, demurely smiling Malvolio from David Collins – cheekily introducing some country matters into the false love letter. Earlier he has given a model display of well-groomed stewardship, leaning forward in an excess of deference, ever watchful, but, sadly, not watchful enough. It always feels that Shakespeare couldn’t work out how to bring Malvolio into the happy ending and so just flung him out of the play. Collins’s delivery of the final vengeful line is bracingly sour. With John Mackay a quixotically silly Aguecheek, Roland Oliver a vulgar and flabby Belch, and sweet singing from Jonathan Nibbs’s Feste, this is a production that satisfies on any number of counts – clever knockabout, comic entanglements, happy discoveries (where Mark Puddle’s Sebastian looks astonishingly twin-like to Elliott’s Viola) and intelligent speaking of the verse. The Observer … Last week I suggested that anyone who wanted to see a satisfying Shakespeare production should go to Sheffield and consider Michael Grandage’s direction of Richard III. There is an alternative. It’s in Bristol. Andrew Hilton’s Shakespeare at the Tobacco Factory is reaching the end of its third (unsubsidised) season. It has what the RSC lacks: a systematic, rigorous approach that makes regular attenders feel they’re acquiring a library of performances. All share the theatrical quality Adrian Noble has deemed necessary to attract an audience used to television: intimacy. Each time Hilton puts on a play he gets you to see it in close-up. His stage is small, which helps, but what he does with it is more to the point. Lighting encloses a speaker on an unadorned stage. Music, from never more than three or four instruments, is used to underline particular moments. And the acting – precise, unflorid – repays attention. Now Hilton has directed a reflective version of Twelfth Night in which high spirits are matched with melancholy. The scenes of revelry are giddy: John Mackay is unleashed into humour as Andrew Aguecheek, with autonymous flying legs and permanently alarmed hair; his spirit constantly struggles to keep up with his body’s comic capers. ★★★★ The Guardian The Royal Shakespeare Company’s Adrian Noble should pay a visit to Bristol. Andrew Hilton’s unsubsidised Shakespeare at the Tobacco Factory outfit is now in its third season, and once again proves that you don’t need star names to make Shakespeare seem essential. Hilton has two aces up his sleeve: an intimate, non-traditional theatre space that makes you feel the story is being told directly to you, wherever you are sitting, and a group of actors who make acting seem as simple as drinking a glass of water. The actors are cross-cast in the two productions that the company undertakes each season, and a core of them have participated in all three seasons so that they seem like old friends. This is a prime example of the ensemble principle that the RSC seems so keen to ditch. I tend to find that Shakespeare slips down more easily with a little sauce; Hilton, though, is a plain cook, whose unadorned approach – no concept, the barest stage possible, music used sparingly – pays dividends, largely because the acting has a telescopic clarity. Every emotion seems magnified, particularly in this production, in which laughter and tears mingle and the losers as much as the lovers take centre stage. This is comedy with an ache in its heart. There are some great performances here: Esther Ruth Elliott’s Viola, bereft of her brother and hopelessly in love with Orsino, hugging her secret sorrows to herself and damming up what threatens to be an ocean of tears. John Mackay, consistently good at this address, is a memorably shock-headed Sir Andrew Aguecheek, who would be scared by his own reflection in the mirror. And David Collins is an excellent Malvolio, his mincing self-importance pricked by genuine tragedy. You feel this is a man who will never recover from the trick played upon him. He will be maimed and twisted for life. Twelfth Night … or What You Will? The naming of this play has long puzzled both editors and producers and we are not the first company to have been tempted to favour the subtitle, What You Will, over the title, Twelfth Night. For although What You Will was never likely to set the Thames on fire, the same could probably be said of titles such as The Comedy of Errors, As You Like It or Much Ado About Nothing. Their chief virtue seems to be in avoiding the common practice of the day which would have been to use the names of leading characters – as in, perhaps, The History of Orlando and Rosalind, or Beatrice and Benedick – at the expense of the wider canvases that all the plays enjoy. But the choice of Twelfth Night remains a mystery. Certainly there is justice in linking the play to a festival of Misrule – when the solemn spirits of sobriety, godliness and decorum were subjected to licensed ridicule and practical joking – but that would be as well placed at the Midsummer Festival as at the New Year. And references in the text to ‘beds of flowers’, ‘summer’ and ‘midsummer madness’ more than outweigh the single one to December and the single one to Lent. And of course Christmas, with which we – probably more than the Elizabethans – chiefly associate Twelfth Night, has no presence in the play at all. So we have approached the play as the last in Shakespeare’s line of summer comedies about love; but one in which whilst Love is supreme she is no longer supremely warm or benevolent. The loves of Olivia for Sebastian and of Orsino for Viola are true and transcendent, but there are also losers in this play where there were none in A Midsummer Night’s Dream or As You Like It. It seems the classical comic model of multiple marriage and unalloyed harmony no longer expresses Shakespeare’s vision of either Life or Love. As Malvolio says, “Fortune, all is fortune”; we are anything but in control of our Fancy and while Fortune smiles on some, it leads others into folly, bitter disappointment, even madness. In Love’s universe, summer and winter are, perhaps, concurrent. In 1600 a Great House like Olivia’s would have been run almost entirely by men – from the Steward, at the head of the House and Estate Staff, down to the gardeners, cooks and cleaners. A significant proportion of these would have been gentlemen in their own right – many of whom would have been maintaining their own establishments elsewhere (with their own raft of servants). Only the lowlier positions would have been occupied by the humbler tier of ‘yeomen’’ or by the – even humbler – ‘grooms’. Service at this level was a route to advancement and wealth. The income of the Duke of Somerset’s steward, Sir John Thynne, enabled him to build the great house at Longleat and project his family into the aristocratic hierarchy; and there are many other such examples of the servant becoming a master in this way. But becoming master of the house in which you served – by marrying its mistress – was, though intensely disapproved of, by no means unknown. In 1553 the Duchess of Suffolk married her Gentleman Usher and, a few years later, her step-daughter, the Duchess of Suffolk, followed her example by marrying her Master of the Horse. Whether Malvolio’s reference to “The Lady o’ the Strachy married the Yeoman of the Wardrobe” has any topical reference we cannot know, but the inference is clear – that, as a happy precedent, it was a significantly more extraordinary union that the one he dreams of with Olivia. The formal difficulties of genuine courtship between the sons and daughters of noble houses – which very possibly multiplied when, as with Olivia, power and position had already been assumed – must have made a great Lady’s daily association with her male entourage all too likely to slide into discreet sexual intrigue and (just occasionally) into those controversial contracts of marriage that bridged the social divide.